Places to see in Bhutan : with a small population of 700,000, Bhutan had been protected from outside world by its rich natural flora & fauna. This isolation has created a diverse language and culture within short range of distance. Takshang or Tiger’s Nest, the most famous monastery and ancient highlights for the people of Bhutan. It was founded as a meditating cave by the famous saint Guru Padmasambhava in the early 8th century upon subjugating a demon and forcing him to take an oath to be the local protector of the region towards the very end. Kyichu Lhakhang, which along with Jambay Lhakhang in central Bhutan is the oldest temple in Bhutan, dating back to the 7th century. Paro Town, the single market town in the dzonghag which is booming (by Bhutanese standards) due to influx of tourist. Trongsa: About four hour’s drive from Wangduephodrang is the central district of Trongsa The Trongsa dzong holds a historic importance for Bhutan’s royal family, being a 350-year old massive fortress made in 1644 atop the hill – the ancestral home of the Royal Family and from where the first two kings ruled the kingdom. Every crown prince is given the title of governor of Trongsa before ascending to the throne. The scenery is beautiful, lush valleys filled with trees, with the Dzong, chortens, prayer flags and high snowy mountains in the distance. One can also see yaks and a species of vultures. Bumthang: It lies in the central Bhutan and is often described as the spiritual heartland of the Kingdom. There are numerous monasteries and spiritual sites in this charming valley where history and mythology help to bring alive much of Bhutan’s culture and traditions. Bumthang is a picturesque valley of beautiful houses, and fields of buckwheat, barley and apples. It lies in the remote district of Bhutan. Although the region is accessible, there are fewer roads than in other parts. The place is increasingly getting isolated, as more and more people are attracted by the urban limelight and modern lifestyle. Lhuntse is perhaps the least developed Dzongkhag of Bhutan. The town of Lhuntse has a series of concrete terraces lying just above the collection of wooden shops and bars. The region is rich in forests, gorges, and cliffs. 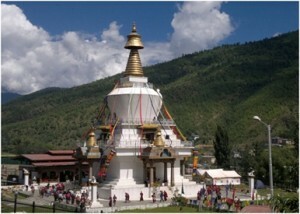 There is also a 113 ft tall statue of Guru Rimpoche atop Takela Hill of Lhuentse. Khoma Village in Lhuntse is known throughout the country for its production of Kishuthara, an extremely intricately patterned silk textile. Samdrup Jongkhar: It is the South Eastern Dzongkhag of Bhutan bordering with the Assam and Arunachal Pradesh states of India. The region lies on the subtropical range with elevations ranging from 200 meters to 3,500 Mtrs. above sea level.